If I bake only one pie for Christmas this year, this is it. 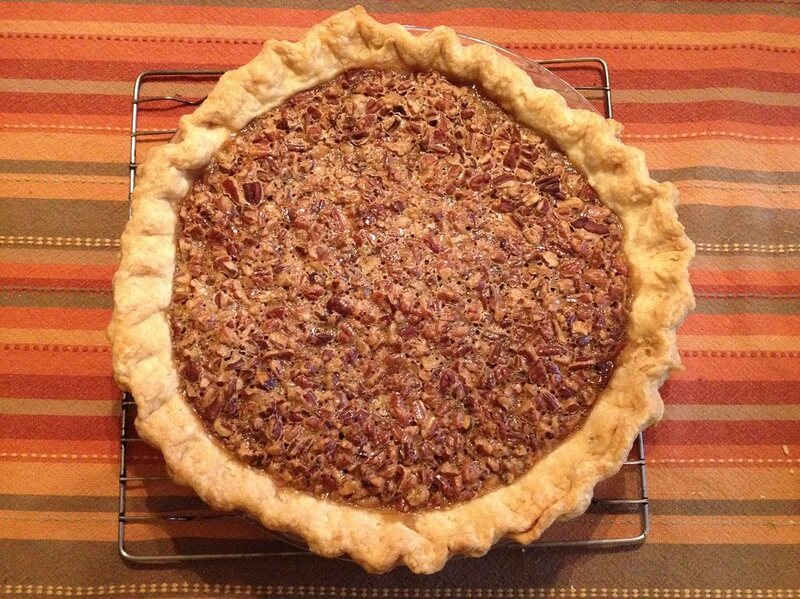 It’s been a few years since I made a maple pecan pie. I used to always follow the Fanny Farmer (aka Marion Cunningham) recipe and it was fine. But this! This is freaking fabulous. God bless the cooking geeks in America’s Test Kitchen who came up with this combination of ingredients. If you like to cook, you should definitely check out their podcast, America’s Test Kitchen Radio. I listen to it while out walking. I made this pie on Thanksgiving morning. I pulled out my Fanny Farmer Baking Book but then started wondering if I should blind bake the crust. The Fanny recipe didn’t require it and I couldn’t remember if the crust had baked enough in the past, so I started googling. I came upon this recipe. Since I had all the ingredients, I decided to give it a try. In the end, the crust was baked perfectly without any blind-baking. If I had blind-baked the crust, the pie would have browned too much in the oven. Baking it on Thanksgiving morning was a mistake because it never had time to properly chill and set up completely, that is, the filling wasn’t quite firm enough, almost, but not quite. It could have used maybe 30 more minutes in the refrigerator before serving. It held together, thankfully, but the next day, it was set up like it should have been. I love using maple in my recipes. It’s worth the expense and has got to be so much better for us than corn syrup. 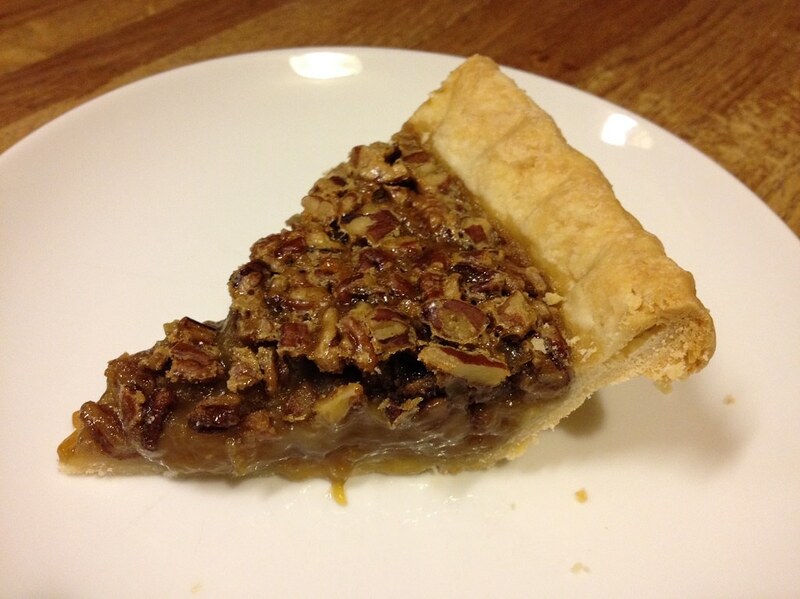 You could easily use walnuts instead of pecans if a Maple Walnut Pie is more your thing. I’ll try that in the future – maybe for Christmas. You’ll need a small saucepan, whisk, 9″ pie pan and cooling rack. Adjust an oven rack to the lowest position and preheat the oven to 450. Heat maple syrup, brown sugar, cream and molasses in a saucepan over medium heat, stirring occasionally, until the sugar dissolves, about 3 minutes. Remove the pan from the heat and let it cool for 5 minutes. Whisk the butter and salt into the syrup mixture until combined. Whisk in the egg yolks until incorporated. Scatter pecans on the bottom of the pie shell. Carefully pour the filling over them. Place the pie in the oven and immediately reduce the oven temperature to 325. Bake until the filling is set and the center jiggles slightly when the pie is gently shaken, 45 to 60 minutes. My last pie took 57 minutes, but the time will depend on your oven and how often you open the oven door. If you wait until the center is set, your filling will be over-cooked. Don’t worry, the filling will continue to bake after you take the pie out of the oven. Cool the pie on a cooling rack for 1 hour, then refrigerate until it’s set, about 3 hours and up to 1 day. Bring the pie to room temperature before serving. I like it plain, but some whipped cream or vanilla ice cream would be nice on the side.